I’ve never seen the film epic for The Neverending Story, but my seven-year-old theatre companion did and was able to share his insights with me. He quite enjoyed it, and wasn’t as scared of the play as he was of the movie version. The little girl behind me, however, started to whimper not even halfway through – and promptly left the theatre with her mother. 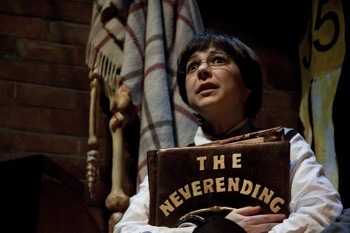 Recommended for kids in grades 3 to 8 by the company, this play features Adamo Ruggiero as Atreyu, who is better known to older kids as Marco from Degrassi: The Next Generation. He did a wonderful job as the young and brave hero in the land of Fantastica. I went into the play clueless about its content, except for maybe the film poster. A bookish boy named Bastian, played by Natasha Greenblatt, is bullied at school and finds solace in a book he begins to read. Unable to put the book down, he delves into its story of Atreyu and his search to save the Childlike Empress and protect her from The Nothing. All the actors in this production are wonderful. Walter Borden, a recipient of the Order of Canada, has an excellent presence and eloquently plays the bookstore owner where Bastian finds the Neverending book. Richard Lee is silly and wacky, sort of like Timon from The Lion King, as Falkor the luckdragon. Bill Merasty, who had the lead role at YPT’s Merlin, was very noble as Artax, Atreyu’s loyal horse. He told me he enjoyed the entirety of the play, and I did too. Although I’m not usually a fan of fantasy stories, this was enjoyable and easy to follow. The series of quests are varied – dangerous, dramatic, fun, and funny. There wasn’t anything too scary, and it’s definitely less scary than the movie. The fog, thunder and lightning are cool effects the kids will enjoy. Adults will enjoy the acting and the metaphors embedded in the tale. Something I really like about the Young People’s Theatre is that it adds curriculum connections, character education and important themes. There’s even an online study guide. The power of imagination is a strong component of the play. There is a Q&A session with some of the actors afterward where the kids can ask them questions. I thought this was a great introduction to theatre for kids. There are booster seats too if they’re short. It plays all throughout March Break and is near the St. Lawrence Market, so you can turn it into a fun day trip!